LAHORE – Pakistan Tehreek-e-Insaf (PTI) chairman Imran Khan on Saturday visited Minar-e-Pakistan to review arrangements for tomorrow’s rally. Uppon arrival, he was given a warm welcome by the party leaders and workers. Shah Mamhood Qureshi, Ibrarul Haq, Jahangir Tareen, Shoaib Siddiqui, Abdul Aleem Khan, Pervez Khattak, Arif Alvi, Ali Zaidi, film director Syed Noor, Waleed Iqbal and others were also present at the rally spot. Renowned singers Ataullah Easkhelvi, Ibrar-ul-Haq, Strings and others have performed in the concert. Party songs were also presented by singers including Ibrarul Haq. Strict security arrangements were made on the occasion. Party workers dance to the drum beats and party songs. 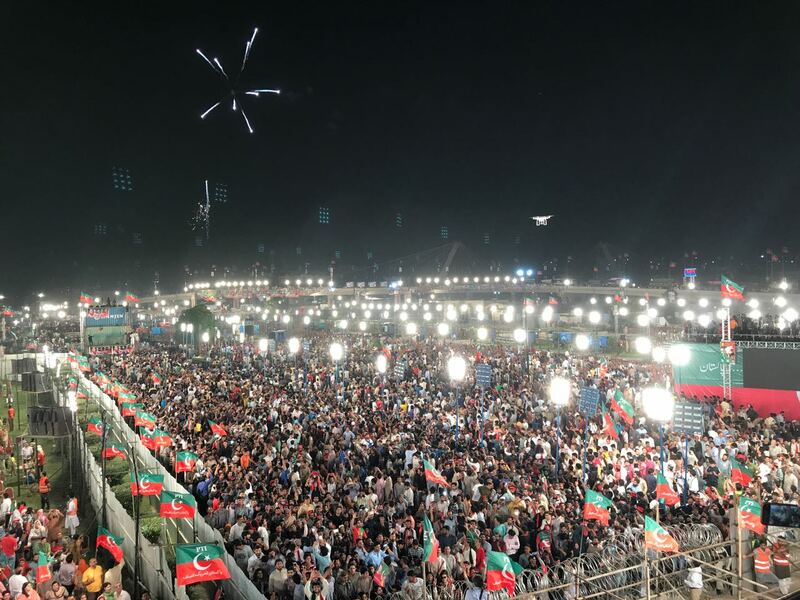 A soundscaped fireworks display over the rally spot entertained audience after the PTI chairman reached Minar-e-Pakistan. Cannon crackers such as star mines were launched in sequence and color summer night sky. Earlier, Pakistan Tehreek-e-Insaf (PTI) chief Imran Khan had reached Lahore along with his better hald Bushra Maneka to join stalwarts and members for celebration at Minar-e-Pakistan in Lahore tonight. 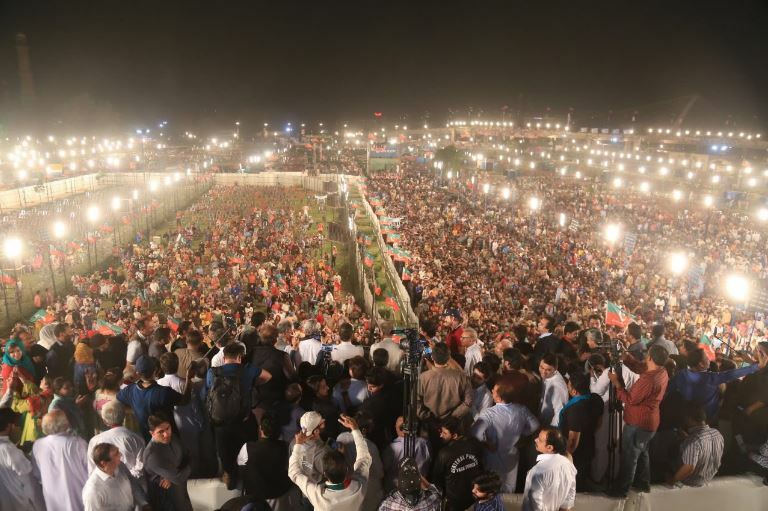 Khan had directed all his party workers from other provinces to arrive in the city till the evening. All the preparations for the public gathering have been completed. A 120 feet long and 60 feet wide stage has been set up for the party leaders who will address the public meeting including PTI chief. 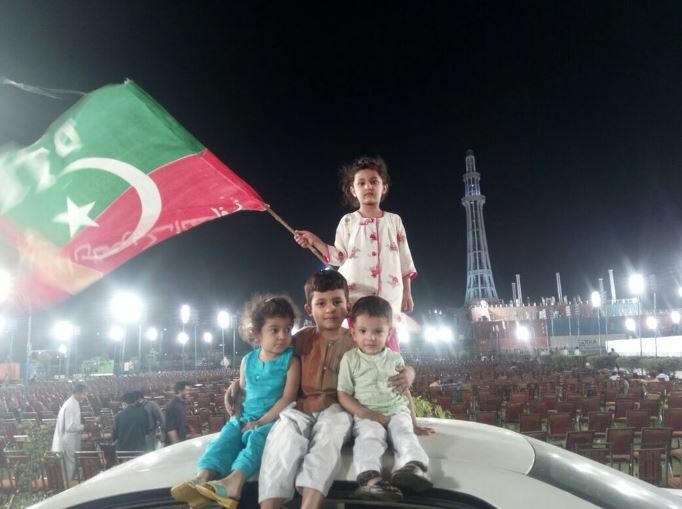 More than 50,000 chairs have been placed in the arena which has also been decorated with flexes and large posters emblazoned with Khan’s pictures. The PTI also issued a traffic plan for tomorrow s rally.